The Montreal Canadiens travel to Joe Louis Arena to play the Detroit Red Wings on Thursday, March 24, 2016. The opening line for this game has the Canadiens at +185 and the Red Wings at -215. The over/under has been set at 5.5. Montreal comes into this matchup having played 74 games. They have an overall record of 34-34-6 and on the road they have a record of 14-20-3. Currently they are 6th in the Atlantic Division. They've scored 196 goals and given up 212 goals for a point differential of -16. The Canadiens have 6 overtime losses including 3 of them in a shootout. In the past 10 games they have an overall record of 4-6-0. For the season they have an ATS record of 32-40 and an over/under record of 34-28-12. Detroit shows up with a record of 36-26-11 including 18-12-6 at home this season. They are 4th in the Atlantic Division. They've scored 186 goals and surrendered 196 for a goal differential of -10. The Red Wings have 11 losses in OT and 5 of them occurred in a shootout. They have a record of 4-6-0 in their last 10 contests. Their record against the spread is 35-37 while their over/under record sits at 27-34-12. Tomas Plekanec has accumulated 48 total points this season for the Canadiens. He has 12 goals this season with 173 shots on goal giving him a shooting percentage of 7%. He has a total of 36 assists on the season and averages 19 minutes played per game. Max Pacioretty has averaged 19 minutes of ice time per game this year. In that time he has a shooting percentage of 9% by scoring 24 goals on 272 shots. He has 30 assists giving him a total of 54 points on the season. Mike Condon has 18 wins and 22 losses this season in net for the Canadiens. He has had 1,290 shots against him and has given up 123 goals. He has made 1,167 saves for a save percentage of 91%. 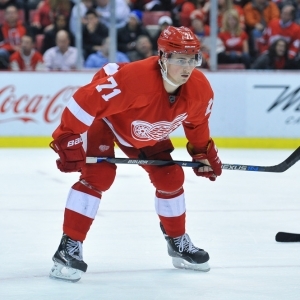 Dylan Larkin has accumulated 43 total points this season for the Red Wings. He has 21 goals this season with 194 shots on goal giving him a shooting percentage of 11%. He has a total of 22 assists on the season and averages 17 minutes played per game. Henrik Zetterberg has averaged 0 minutes of ice time per game. In that time he has a shooting percentage of 0% by scoring 13 goals on 185 shots. He has 32 assists giving him a total of 45 points on the season. Petr Mrazek has 26 wins and 15 losses this season in net for the Red Wings. He has had 1,377 shots against him and has given up 106 goals. He has made 1,271 saves for a save percentage of 92%. The Canadiens have 74 total points this season. They have scored 191 goals while giving up 209 goals. They have had 234 power play opportunities and have scored 39 goals on those chances for a percentage of 17%. The Canadiens have allowed 228 power play opportunities and given up 37 goals on those chances for a penalty kill percentage of 84%. They average 31 shots per game and as a team are shooting 8.39% for the season to this point. They allow 29 shots to their opposition per contest and have a team save percentage of 90%. The Red Wings have a total of 83 points on the season. They have 41 power play goals on 233 opportunities thus far for a percentage of 18%. They have allowed 244 power play opportunities and have given up 46 goals on those chances for a penalty kill percentage of 81%. As a team, the Canadiens have a total of 184 goals scored while they've given up 191 goals to this point. They average 30 shots per contest and have a team shooting percentage of 8.48%. As a team they give up 30 shots per game and have a save percentage of 91%. Montreal has a Corsi percentage of 51.9% as they've attempted 4,304 shots on net at full strength while they've given up 3,992 shots on net in the same situations. Their Fenwick percentage is at 51.2% as they have 3,112 attempts while they've given up 2,963 shots on the defensive end. The Canadiens start possessions in the offensive zone 49.8% of the time while their defensive zone percentage is at 50.2% for the season. They have 2,390 face off wins compared to 2,317 losses, meaning their faceoff win percentage is 50.8%. On defense Montreal has 1,763 hits and they've blocked 1,029 shots from the opposition. Detroit has attempted 3,966 shots at full strength and they've given up 3,759 attempts, meaning their Corsi percentage is at 51.3% for the season. In terms of Fenwick percentage, they currently are at 50.2% as they have 2,992 shots while they've given up 2,969 attempts on defense. The Red Wings have an offensive zone percentage of 53.8% and their defensive zone percentage is 46.2% so far this season. They have a faceoff win percentage of 50.2% as they've compiled 2,118 face off wins this season and they have suffered 2,102 face off losses. On defense Detroit has blocked 790 shot attempts and they have 1,476 hits as a unit.